Municipal water supplies are often contaminated with a number of impurities that may be hazardous to human health; such as pathogens (microscopic biological organisms capable of causing disease, including viruses, bacteria, protozoa, toxins and cryptosporidium), chlorine (often added to the water supply as a disinfectant), heavy metals (byproducts from industrial processes and consumer waste) and nitrates from pesticides (runoff from fields where crops are sprayed). While chlorine kills bacteria and oxidizes organics present in feed waters, pathogens such as cryptosporidium or giardia are resistant to disinfection and must be removed by other methods such as ultrafiltration (UF). UF has proven a successful alternative to conventional treatment for the removal of protozoan cysts. With proper pretreatment, UF membrane technologies provide complete removal (ranging from >4 log to 6 log) of all protozoan cysts of concern. For further drinking water treatment, reverse osmosis (RO) and nanofiltration (NF) elements have proven to be a successful and cost-effective technology to remove harmful heavy metals, disinfectant byproducts, organics, hardness, TDS, nitrates and color to meet safe drinking water quality requirements. * Note: Because chlorine and other oxidizing agents are often used to kill bacteria and oxidize organics, please be aware that the ACM2, ACM3, ACM4, ACM5 and ACMX RO membranes are of polyamide chemistry and should be used after dechlorination steps; these membranes cannot tolerate chlorine or other oxidizing agents (less than 0.1 ppm). ** Note: TurboClean® Beverage – Cellulose Acetate RO and NF Elements may be used to deliver high quality water for drinking and bottled water. The patented TurboClean hard shell offers a safe and sanitary operating system with none of the stagnant areas created by the brine seals of fiberglass membrane elements where bacterial growth is often found. Because these elements feature a cellulose acetate (CA) membrane, these elements may tolerate chlorinated feed streams of 0.5 ppm nominal and up to 1 ppm chlorine. This is especially beneficial for systems to control biofouling, where free chlorine is used to maintain a sanitary environment or for systems that have feed streams containing trace amounts of chlorine (i.e. to kill bacteria and oxidize organics). If an NSF/ANSI Standard 61-certified element is needed for a drinking water system but is not found in the above list, please contact MICRODYN-NADIR. TurboClean® Beverage UF 10K Elements may be used to remove larger particles present in the drinking water system to deliver high quality water. The TurboClean® Bev 8040-UF element features a 10 kDa membrane suitable to remove suspended solids, proteins and viruses. TurboClean® Beverage Thin-Film Composite RO Elements deliver high purity, low TDS (dissolved solids) water for bottled water and drinking water. TurboClean Beverage RO elements are available in several membrane chemistries: standard high rejection RO (ACM2), low-fouling (X-20™), and low energy RO (LE). TRISEP® ACM2 High Rejection Brackish Water RO Elements offer high removal of harmful heavy metals, disinfectant byproducts, organics, hardness, TDS, nitrates, boron and color to meet safe drinking water requirements. TRISEP® X-20™ Low-Fouling Brackish Water RO Elements also offer high removal of harmful heavy metals, disinfectant byproducts, organics, hardness, TDS, nitrates, boron and color to meet safe drinking water requirements. X-20 membrane is a fouling-resistant membrane with a unique, proprietary formulation that results in low-fouling characteristics. The unique barrier layer chemistry does not degrade over time like some competitive "fouling resistant" membranes that are simply modified or coated standard membranes. X-20 elements are excellent when treating feed waters contain higher organic levels while offering consistent high salt rejection and lowering cleaning frequency. TRISEP® TS80 High Rejection NF Elements have proven to successfully remove color as well as harmful trihalomethane (THM) precursors from water while also removing hardness, alkalinity, sulfates, bacteria, organics and other impurities. Boron is a compound widely distributed within the environment both from natural sources and increasingly from industrial activities. In minute concentrations, it serves as an important micro-nutrient for living organisms. However, in sufficient quantities, it has been shown to have adverse health effects on human beings as well as plants and animals. As a result, boron removal has become an increasingly important compound of concern within water treatment. The approximate mole fraction of each species of boron at various pH. Boric acid becomes prevalent at pH < 8 whereas borate ion becomes dominant at ph > 10. Unlike most of the other elements in water, boron is not ionized (has no charge). Boron takes two forms in water: boric acid, B(OH)3, or borate ion, B(OH)4-. 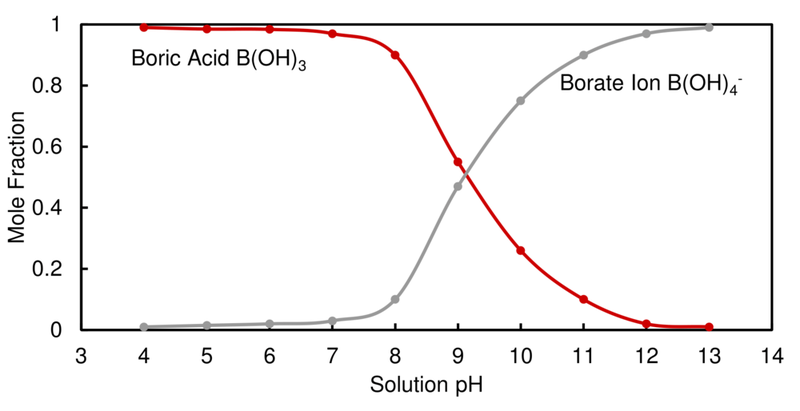 The relative concentrations of boric acid and borate ion are dependent on pH (as described in the figure to the right), temperature and salinity. Boric acid becomes are prevalent at pH < 8, whereas the borate ion will become dominant at pH > 10. The effectiveness of reverse osmosis as a boron removal technology is highly dependent on the form in which boron is found. Because RO and NF membranes are much better at removing charged ions, the removal of borate ion is easier than the removal of boric acid. The rejection of boron under neutral or acidic conditions where uncharged boric acid is the dominant form is frequently less than 50%. Rejection of boron under highly alkaline conditions where the negatively charged borate ion is dominant can exceed 90%. Both TRISEP® X-20™ and ACM2 high rejecting RO membranes have proven to reject boron to a high degree. Nitrate (NO3-) and nitrite (NO2-) are compounds that are naturally formed when nitrogen (N) combines with oxygen (O). Nitrate is used mainly in inorganic fertilizers, but is also used as an oxidizing agent, in the production of explosives and for glass making. Nitrates also naturally occur in plants as a key nutrient. Nitrates and nitrites are frequently added to processed meats as a food preservative. They are also formed endogenously in mammals, including humans. Nitrate is secreted in saliva and then converted to nitrite by oral microflora. Nitrogen is essential for all living things—human bodies need nitrates to some extent, as they prevent the growth of bacteria—but excessive consumption may lead to serious health complications. Ingesting excessive nitrates in drinking water may lead to “blue baby syndrome”, a condition some babies are born with, causing the overall skin color to have a blue or purple tinge. The nitrates bind to hemoglobin (the compound which carries oxygen in blood to tissues in the body), and results in chemically-altered hemoglobin (methemoglobin) that impairs oxygen delivery to tissues, resulting in the blue color of the skin and may lead to brain damage, coma or even death. In adults, the inability to carry oxygen through the blood may cause dizziness, headaches, irritability and blue tones to the skin. Some studies have also suggested that higher levels of nitrates or nitrites may lead to increased incidence of cancer in adults and increased incidence of brain tumors, leukemia and nasopharyngeal (nose and throat) tumors in children. Due to health considerations, the maximum contaminant limit for nitrate in drinking water has been set at 10 mg/L nitrate as nitrogen (44.3 mg/L as NO3) in the United States and Canada. A similar guideline of 50 mg/L as NO3 has been set by the World Health Organization (2011), while the European Community (EC) standards allow a maximum admissible concentration of 50 mg/L as NO3 and a guide level of 25 mg/L as NO3. 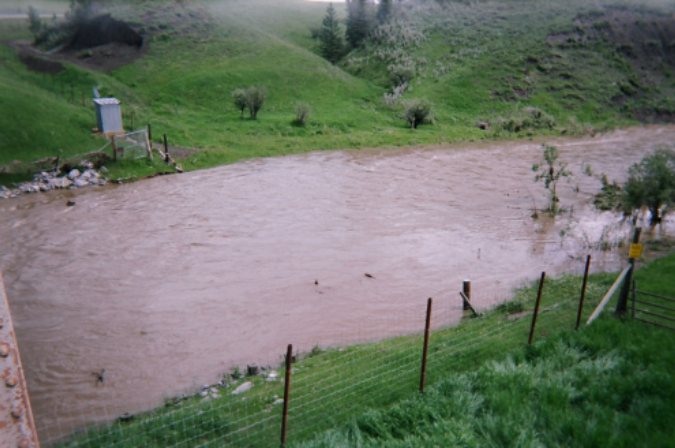 The nitrate concentration in surface water is normally low (0-18 mg/L) but can reach high levels (several hundred mg/L) due to agricultural runoff, the use of pesticides or contamination from wastewater sources. Most nitrate contamination is a result of intensive agricultural processes and the use of nitrogen-containing fertilizers (containing nitrate as well as ammonia, ammonium, urea and amines). After fertilization, crops take up a relatively small portion of nitrogen (approximately 25-30%) and the residual nitrogen compounds end up in the groundwater and surface water. This groundwater or surface water is then treated to become drinking water with acceptable nitrate concentration levels. United States Environmental Protection Agency (U.S. EPA, 2010) lists reverse osmosis (RO) as an accepted potable water treatment method for nitrate removal. RO membrane elements may be used to simultaneously desalinate (reject dissolved ions) and remove many other contaminants including particulates and organic constituents. Estimated rejection rates for sodium nitrate (NaNO3) can be as high as 93-98%, respectively. MICRODYN-NADIR offers a wide range of RO elements that have been successfully used in drinking water systems. For more information, please refer to Drinking Water. Membrane technology has become more widely accepted in seawater and brackish water treatment applications due to more stringent water quality standards, a decrease in adequate water resources and an emphasis on water reuse. New water quality requirements have challenged membrane manufacturers to develop special products for selective removal of hardness, natural organic matter, trihalomethanes (THMs) color and many other contaminants. Beverage producers in particular, must remove color and THMs from their beverage make-up water to meet FDA requirements. Color often exists in surface and ground water sources which contain high levels of organic material influenced by decomposing vegetative materials. Many process and water purification applications require color removal before the water can be used further in the process or before it is discharged into a river stream. Trihalomethanes (THMs) are a group of four chemicals that are formed along with other disinfection byproducts (DBPs) when chlorine or other disinfectants used to control microbial contaminants react with natural organic matter (NOM) and inorganic matter in water. The four THMs include chloroform, bromodichloromethane, dibromochloromethane and bromoform and have been known to cause cancer and other toxic effects to human beings. The United States Environmental Protection Agency (EPA) has published the Stage 1 Disinfectants and Disinfection Byproducts Rule to regulate total trihalomethanes (TTHM) at a maximum allowable annual average level of 80 ppb (or 80 µg/L). Nanofiltration membranes, specifically TRISEP® TS80 elements, have proven to successfully remove color as well as harmful THM precursors from water while also removing hardness, alkalinity, sulfates, bacteria, organics and other impurities. In Northern Europe, 90% of the population is served with treated surface or lake water. Because surface waters typically contain natural organic matter (NOM), a complex mixture of organic compounds (i.e. decomposing vegetative materials and animal matter) and color, this water must be treated to produce safe drinking water. NOM removal from source waters is very important in drinking water treatment because it affects the color, taste and odor properties of water, contributes to disinfection byproduct formation, increases chlorine or disinfectant demand and affects biological regrowth in distribution systems. Since NOM in most surface waters consist mainly of humic substances (molecular weight of 1,000-10,000 Daltons), it is possible to separate these humic substances directly by nanofiltration (NF), especially if the NOM concentration and color content is high (>30 mg Pt/l) and turbidity is low (<1 NTU). Small and remote communities in Northern Europe rely on simple and easy to maintain surface water treatment systems, typically less than 3,000 m3/day (0.8 MGD) and up to 16,000 m3/day (4.2 MGD). Spiral-wound nanofiltration systems have proven to meet the needs of these communities as they are fairly automated and require little attention from system operators. Most of these small drinking water systems consist of cellulose acetate (CA) membranes with a molecular weight cut-off of 1,000-2,000 Daltons (Da). CA membranes are preferred (over polyamide membranes) due to their chlorine tolerance and non-polar, smooth membrane surface which leads to less fouling. Even though the CA membrane may be less prone to fouling, pretreatment and regular cleanings are recommended to ensure longer membrane life. A typical NF plant for NOM removal consists of a pretreatment unit using a 50 micron sieve. The pretreated water is then sent to the NF membranes for color removal and organics reduction. Some of the concentrate from the NF membranes is recycled back to the feed in order to increase recovery (typical system recoveries are 70-80%). An alkaline filter (calcium carbonate) is often placed after the NF system to increase the level of calcium and bicarbonate in the typically soft and corrosive water. These systems are operated at a pressure of 4-8 bar (58-116 psi) and a flux of 15-18 lmh (8.8-10.6 gfd) and have proven to last 5 or more years. To prevent membrane fouling, the membranes are generally cleaned daily using a chemical rinse. Additionally, a more intensive cleaning is performed once or twice a year. TRISEP® SBNF, a CA membrane with a nominal molecular weight cut-off (MWCO) of 2,000 Da was developed specifically for customers treating surface waters in Northern Europe and is well-suited for removal of organics and color. These SBNF elements are available in 4- and 8-inch sizes and varying feed spacer thicknesses. A specialty element, certified by the Drinking Water Inspectorate (DWI), is also available for use in drinking water applications in the U.K.: 8040-SBNF-DWI element.